The University of Notre Dame on Monday (March 3) released a new strategic plan that provides focus, transparency and accountability for its activities for the next 10 years. 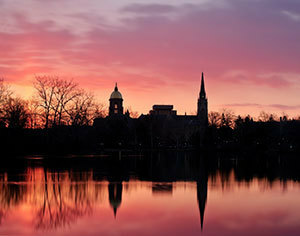 Named “A Legacy Expanded,” the plan builds on the five goals Notre Dame President Rev. John I. Jenkins, C.S.C., outlined in 2005, his inaugural year as president. Each goal includes a set of enduring commitments — well-established strategies that have and will continue to guide future actions — as well as enhancement areas that will spur new energy and innovation in the University’s pursuit of that goal and, ultimately, its overarching vision. Father Jenkins said the critical meetings that went into Notre Dame’s deliberate planning process gave leaders across campus a chance to raise their gaze from the immediacy of day-to-day demands and together identify longer-term aspirations, consider their place in the University’s broader goals and think about how to realize them. Ensure that our Catholic character informs all our endeavors. Offer an unsurpassed undergraduate education that nurtures the formation of mind, body and spirit. Advance human understanding through scholarship, research and post-baccalaureate programs that seek to heal, unify and enlighten. Foster the University’s mission through superb stewardship of its human, physical and financial resources. Engage in external collaborations that extend and deepen Notre Dame’s impact. In formulating this plan, the University has sought to align the goals of the various divisions of Notre Dame with the University goals and with one another. There will be periodic reviews of this plan, and it will be adapted as circumstances change and new opportunities arise. “A Legacy Expanded” can be found online at strategicplan.nd.edu. Originally published by Brendan O’Shaughnessy at news.nd.edu on March 03, 2014.